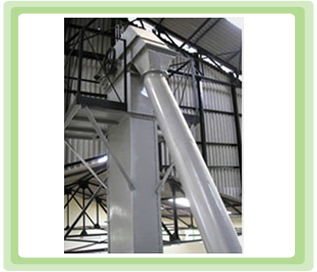 Bucket Elevator is used to transfer the material from ground level to certain height vertically. 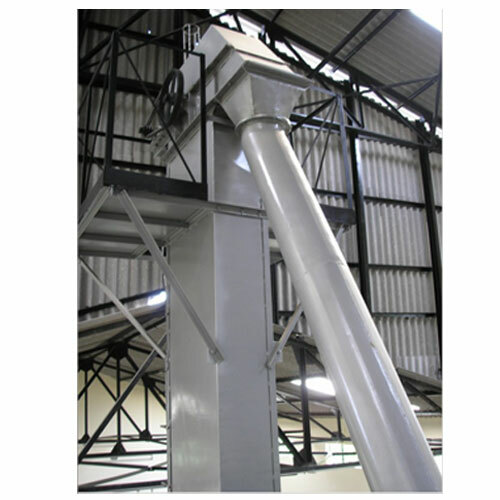 It consists of a Nylon or Rubber Belt running on one Drive Pulley at the top and the other one is Driven Pulley, which is at the bottom inside a fabricated casing. Belt is fitted with Buckets at some specific intervals. Buckets lift the material from ground level to a higher level and buckets are emptied while moving around top pulley by centrifugal action. Elevator is driven by top pulleys by speed reduction mechanism. Either set of pulleys or gearbox can be used. Bottom pulley has sliding mechanism for maintaining proper tension and alignment in the belt. Top pulley is rubber lagged to avoid wear and tear of belt during movement. A platform is also provided for maintenance purpose at the top of the elevator. Both the pulleys are dynamically balanced for noise free performance.